Have you experienced attending an interview at a big corporate company? If so, did you notice the way the workplace of the receptionist is laid out. You are sure not to miss the arrangement of the telephone on the table, the location of the desktop or the way the files are organized. You might have even noticed the way she or he makes an entry in their diary. What does this all imply? It denotes that the organization or the company has a specific organizational trend of getting their work done. The company expects the receptionist to possess those organizational skills. So let’s dwell more into organizational skills. It is the ability of an individual to make use of their time, energy and resources available in an effective manner to achieve their goal. To be successful in any work, it is necessary for an individual to know how to meet targets, to work independently, to prioritize and plan for the future. Organizational skills are those that allows individuals to know their work activities like keeping track of things or prioritizing their activities. It is a technique that involves making proper arrangements around their table or in their work schedules. It could involve keeping their desks clean, placing their papers and pens in specific allotments, arranging files in alphabetical order, writing notes in a book, having a notice board to put up schedules, etc. Why Organizational Skills are Important? An organized work place means having a place for everything. How would it look when after coming to office, you see your table having scattered papers, split coffee on the table, pens scattered, files piled, etc. Organizing involves the re-arrangement of the table that would allow the worker to focus on his work such that there is no error. So let’s see why these skills are important. By knowing about the duration and the importance of the activity, it helps one to balance the work effectively and efficiently. It is known from the study, that people having this skill know how much to do and for how much duration keeping a balance between all the activities. The work is organized in their mind and it becomes part of their life as well! Imagine, you need to clear the invoice and you couldn’t find the payment voucher as you forgot where it is misplaced. If the workplace is disorganized, which means misplaced papers or improper filing system, then any requirement for getting clearance for the customer could get delayed. Hence, one of the main aspects of organizational skill is to arrange your documents into a proper filing system. Considering the previous example, the clearance for payment which should have been completed in 5 minutes would have taken 20 or 25 minutes. This causes lots of panic, distress and stress to you wasting your time and the customer’s time. If you are project head and need to know about the progress of work, having a proper scheduling or excel chart would be useful. This is important in managing time when time is a crucial factor. Having an organized financial management system allows monitoring of the receivables to know their cash flow. Without such a system, there could be unpaid invoices, which in turn would affect the supply chain and thereby the business suffers. Besides, having an organized system would help the company to know about their expenses to make necessary changes to their spending strategy. Wondering how it will affect customer’s satisfaction? Imagine having an online shop and there is no FIFO system, customers would be dissatisfied with late deliveries. It is worst if there is no proper billing system, when the customer could be charged duplicate times creating bad image as there is no track of paid or unpaid bills. This would ultimately affect the satisfaction of the customer thereby hitting the revenue of the business. Unorganized workplace creates a havoc as the information required by the management is not known leaving the workers distressed. They would have to look through unsorted files, searching for the information which creates stressful environment. The next chain of events is frustration in the job, nightmares and hate for the work. Having an organized workplace brings clarity to employer and employee. In general, workers with these skills know how to schedule their work, plan for the activities, help to boost productivity, know how to prioritize, and know how to take forward in case of unforeseen hurdles. These skills are not meant for the top management alone, but for every employee in the organization to be in sync with the objectives of the company. Below are some of the examples of organizational skills. This is the first stage of any work assignments undertaken and such people are often keen on making a plan of the work to be done sketching out schedules. These people figure out the approximate time of completion of each task and follow their plan with discipline. Also, they have hand in identifying the resources required for the work. Hence, good planners are wanted by the company as they approach their work with speculation and act spontaneously. a specific time frame. An employee is said to prioritize their work who knows which task is to be completed earlier than the other. Through this process, it helps to sequence the work with decreasing importance. Being able to complete the work within the time frame or within target date is considered as a critical organizational skill. The process includes making schedules and inflicting time frames for each activity that helps one to manage their time effectively. This quality of looking through fine lines is another important aspect needed for a company to grow. It is particularly visible in people belonging to finance, audit or project management. Their profile would not miss out on minor aspects as it would be a major issue for them. Besides, they wouldn’t overlook any part of their work assigned. Hence, a person with strong organizational skills is considered to have ability to manage the work, plan wisely, be disciplined, optimize their time, stick to deadlines, able to delegate, able to make decisions, manage teams, make schedules, and set smart goals. Without these qualities, inefficiency causes confusion within the organization. Attend an interview and you are sure to be asked about your organizational skills. Let’s see what ways the questions are posed. By reviewing this question, it indicates your perception of that project and how you upgraded your skills to handle it. Brief with examples about the project, which enhanced your skill set with time management, planning, better communication skill and develop self-confidence. Moreover, you also need to elaborate about your multitasking capability and show your strength in prioritizing. As this skill is an important part of any job, the interviewer would prefer to know about your work style. Give a brief account of the process of your organization and how you had fit into the process to get the job completed. For example: You could indicate about creating a to-do list in front of your calendar or on the yellow sticky papers. Explain that it helped to organize your work and make necessary arrangement for the next day. Also indicate that it was important to prioritize yourself for meeting deadlines. Brief about how it helped to keep track of completing work. Through this point, the interviewer gets to know how you planned your work and how successfully it had helped. Keep your methods numbered so that you know you haven’t missed out. Indicate the way you start your plan and how much time frame you need to complete the work. Give a brief about some activities that required a longer duration for which you had to indicate the possible setbacks and how you managed them through proper planning. Through this question, the interviewer intends to get information about the way you would handle the work and what sort of methods you would be employing to execute it without hassles. You need to explain how you would break down the work to simpler steps to know what activities are involved. Then to get the work completed on time, you need to indicate about delegation. It is one option if the tasks involve certain skill set which you don’t possess. It is the best way to handle complicated or complex tasks. Here the interviewer intends to find out how you managed to execute and complete the work. Bring out an important assignment that required for you to review all the steps involved. By doing so, you need to show that you broke it down to major and minor tasks. Explain that it helped you to know which required more time so that you could seek help. By this question, the interviewer would be keen to know what methods or what factors decides priority criteria. There are chances that a hypothetical question could also be asked. You need to brief on how you make a list of the day’s activities and assign importance of each. Also indicate how much time it requires and who else are involved in completing. Some task force requires involvement of different work groups and hence might affect the priority. To counter those effects, indicate how you multitask, being flexible and adaptable, in between to get it completed. This sort of question is to verify your integrity and your temperament. Moreover, it also would indicate flexibility and adaptability to change. By giving an example, you need to indicate that you didn’t lose your temper on the interruption of work schedule. You would need to talk about how you calmed yourself and created a new schedule giving priority accordingly. This question is posed for you to indicate how well you have looked through the details without missing out any factors. You can describe a situation when you had to look through the details and did not overlook the fine lines especially during an audit. For this, you would need to indicate the context in which details were required and what methodology you followed. i. How would you react if your planning did not achieve expected positive results? This question would help interviewer to know how well you handle situations if it goes out of track. Explain that you would make corrective actions for those activities through proper analysis to ensure that the project gets completed. By doing so, you have shown your positive attitude. Moreover, it also shows that you have taken proper measures to see that, matters which need attention would not be overlooked. 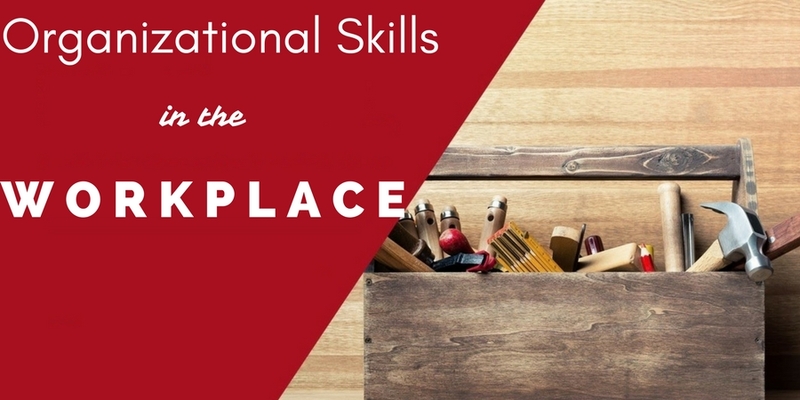 Looking through the aspects of organizational skills and the typical skills, all companies are pertinent to have their employees with good organizational skills. Having organized employees’ means they would work quickly increasing productivity and thereby profits. It does not stop with employees or employer but also for workplace in which cluttering and mismanagement cannot be tolerated. So for better management of work, think about enhancing your organizational skill to be recognized.